By Peter Brand. Soft cover. 154 pages. $25.00, 2012. PO BOX 1030, Meadowbank, NSW 2114. 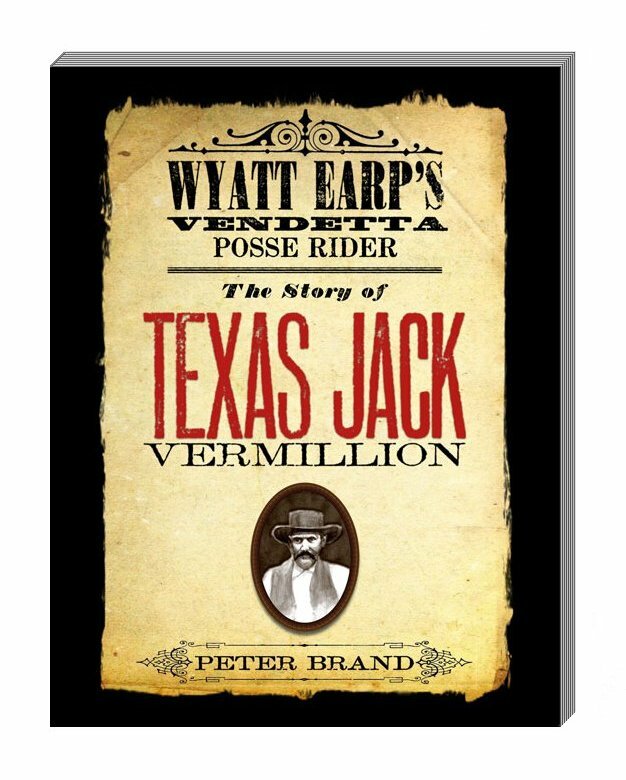 In her book, The Frontier World of Doc Holliday – Faro Dealer from Dallas to Deadwood, Pat Johns stated that “Texas Jack Vermillion”, Wyatt Earp’s Vendetta posse rider’s real name was John Wilson Vermillion who, in later life, lived in Big Stone Gap, Virginia, where he bought a farm, raised a family and died in 1910. Through the following decades, this remained the perceived probability among writers. In the mid 1990s, Australian Peter Brand, whilst on a trip to Tombstone, Arizona, had a chance meeting with two Arizonians, Jean and Chuck Smith. This led to a friendship and resolve to work together in an endeavour to reveal the lives of all the illusive Vendetta Posse. The August 2010 issue if the Wild West History Association Journal contained an article by Peter Brand titled, Duty Bound, which proved beyond doubt that John Wilson Vermillion was not “Texas Jack”. It was while Brand was researching that article that the true identity of Texas Jack Vermillion was discovered. Born in 1845, the eldest of his mother’s fifteen children, at age eighteen he listed in the Union army and fought with his regiment until mustered out in June 1865. John returned to the family home and within two years struck out West to find his fortune. Fifty-four years later, on Easter Sunday, 4 April, 1920, a homeless seventy-four year old man, showing visible signs of failing health, appeared at the home of James Leonard Vermillion carrying a small suitcase and presented himself to a stunned James as his long lost brother, John. Brand reveals an itinerant, secretive man that made no enduring friendships and whose movements for many years at a time still remain unknown. He travelled throughout the West as far north as Alaska. The first documented record of “Texas Jack” in Tombstone is February 1881 where he aligned himself to the Earp brothers. By the time the shootings began, he had physically committed himself to the Earp cause and the conflict of the subsequent vendetta and beyond. His next career move was even more questionable when he threw in his lot with Jefferson (Soapy) Smith’s gang of gambling gun thugs, political racketeers and confidence men. By 1900, Vermillion had returned East. In many ways this is the more absorbing part of his eventful life for when he applied for a military service pension it initiated a Washington investigation that pursues him for the rest of his life. Peter Brand has demonstrated just how documented history still lays waiting for dedicated and resourceful researchers to uncover. There is a wealth of new information contained in this publication of the gambling gun thugs and confidence men who were such a significant component of the town and cities throughout the states and territories. I was delighted to find, among the seventy-two photographs, mug shots of men who, till now, have been just names, such as Tombstone’s pugnacious Ben Maynard, George “Shotgun” Collis, John “Crooked Mouth” Green, John “Fatty” Gray aka John Morris, and, of course, “Texas Jack” himself. Another is the well known “hats on hats off” photograph of the Soap Gang taken in Skagway, Alaska in 1898 shortly after Soapy’s death. Brand raises the question that one of the men in the picture is “Texas Jack”. There are endnotes but no index and an appendix, which consists of Brand’s 2010 Duty Bound article. A disappointment for me is the grainy quality and size of some of the photographs. It is published in A4 format. If you have an abiding interest in anything Earp, the men that rode with them and the gambling wars that their lifestyle attracted, then you will enjoy this book.